Testimonial: Oil Mist Collector in Food Manufacturing Process - Sentry Air Systems, Inc.
Pretzels, Inc. has been in the baked snack food business for over 30 years and produces a multitude of pretzel products as well as flavored corn products. Pretzels, Inc. utilizes the Model 300 Mist Collector [Model # SS-300-MIST], shown below in their facility. 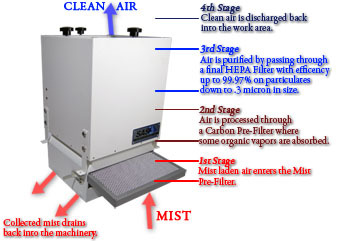 Filters: MIST Pre-Filter, HEPA Filter (up to 99.97% efficient on particles 0.3 microns and larger) or ASHRAE Filter (up to 95% efficient on particles 0.5 microns and larger). In addition to the Model 300 Mist Collector, Sentry Air offers a Model 200 (up to 50 CFM), Model 400 & Model 450 Mist Collector (up to 700/up to 950 CFM). For additional information on this mist collection line, give us a call at 1.800.799.4609, email us at sales@sentryair.com, or fill out this simple online form to receive more information from a Sentry Air Systems Application Specialist.